Two kids, baby goats, were picked up by the Belfast (ME) PD wandering near High Street early Sunday morning. Sgt. Daniel Fitzpatrick 'captured' the two kids and had them in his squad car driving around town. While driving around all morning, he posted photos of himself and the goats on the Belfast Police Department Facebook page. The post said that while Sgt. Fitzpatrick loves the company, he is running out of vegetables for the goats. 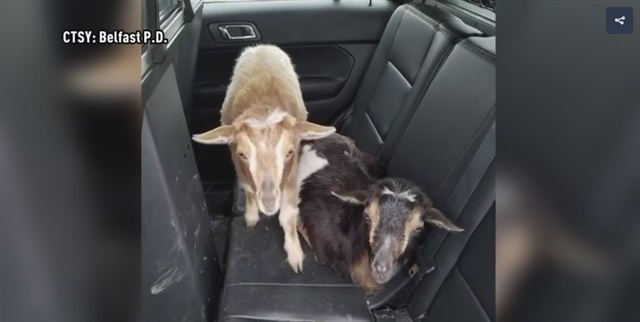 Finally, at around noon, owner Jillian Clapp realized the goats were at the police department and arranged to pick them up, WCSH TV reports.